PRODUCT: Backer Rod STANDARD Insertion Tool Set (for Walls/Floors). 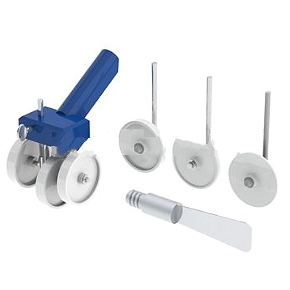 Set includes 4 insertion wheels: 1/8", 1/4", 3/8" and 1/2" wide, and a metal backer rod tamping tool. PRICE/SET. Interchangeable wheels accommodates common widths.